The first time I saw Paestum I was 11 years old. Even then, I was an archeology and mythology nerd and was fascinated by the wonders of this place. It took many years, but I finally went back to Paestum this year! It was every bit as enchanting as it was then-maybe even more! 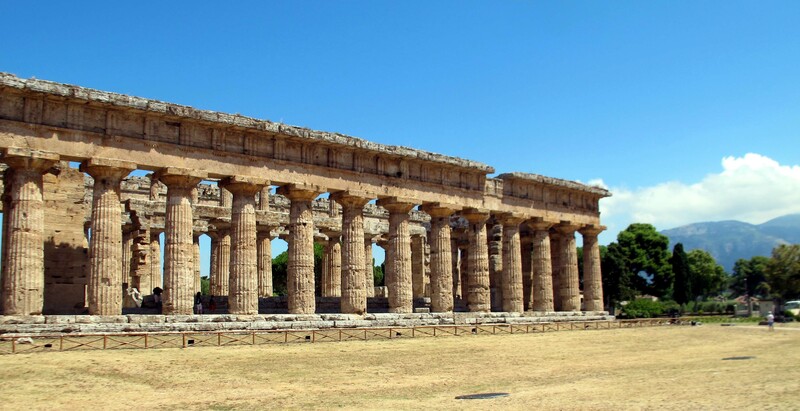 Paestum was founded around 600 BC by Greek colonists from Sybaris, a Greek colony in Calabria. They named it Poseidonia, after Poseidon, Greek God of the sea. Poseidonia became a prosperous trade center in Magna Grecia, the Greek colonies in Southern Italia. They even minted their own coins. The Lucanians took over around 390 BC and called it Paistom. 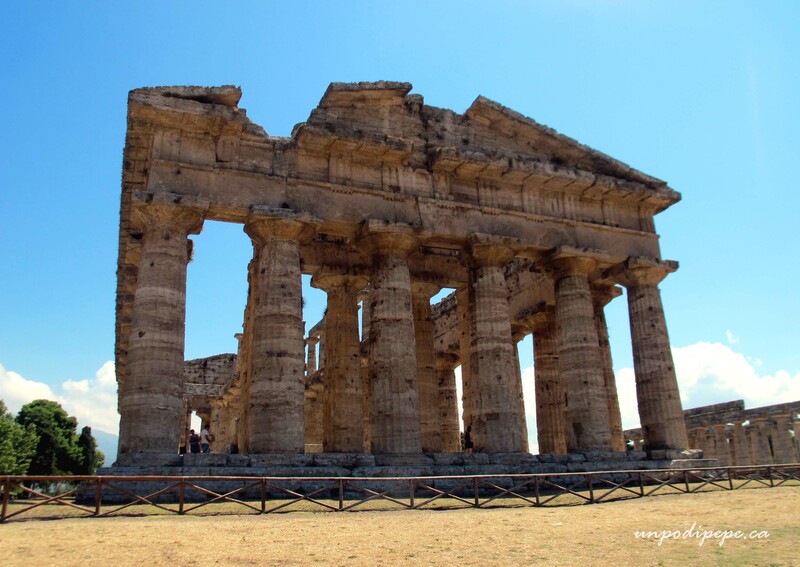 In 273 BC, the Romans conquered, Latinized the name to Paestum, and constructed more buildings. Paestum was partially damaged by an earthquake after the eruption of Vesuvius in 79 AD. In the 5th Century AD with Christianity came a Paleochristian church and a Bishop. Deforestation and other factors led to conditions that brought malaria. 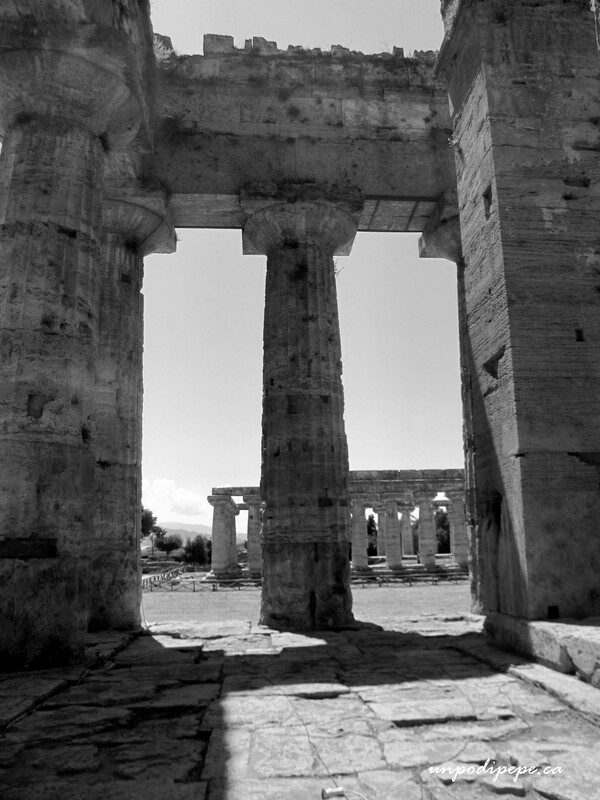 The malaria plus Saracen attacks caused the abandonment of Paestum by 877 AD. The inhabitants retreated to higher ground at Capaccio, 6 km away. 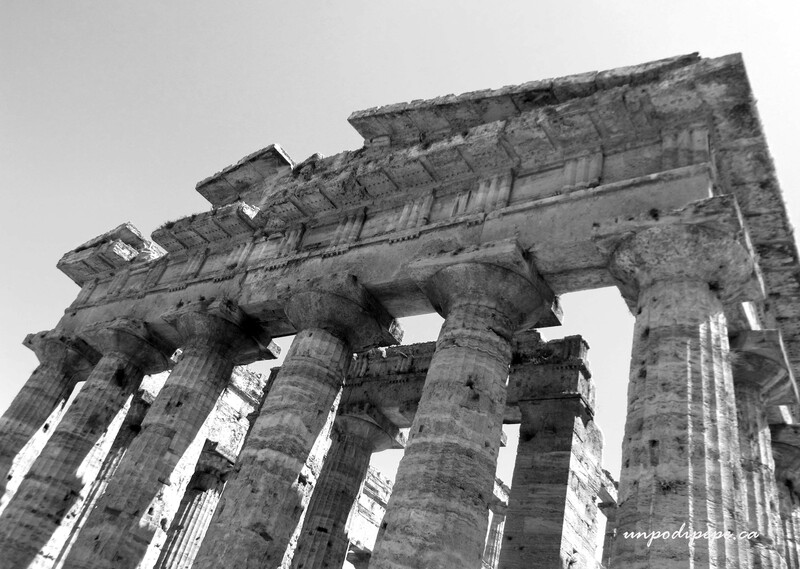 Overgrown by forest and buried by swamps, Paestum remained hidden and forgotten for almost 900 years. In 1748, the temples were rediscovered by road builders, who apparently kept ploughing right through. 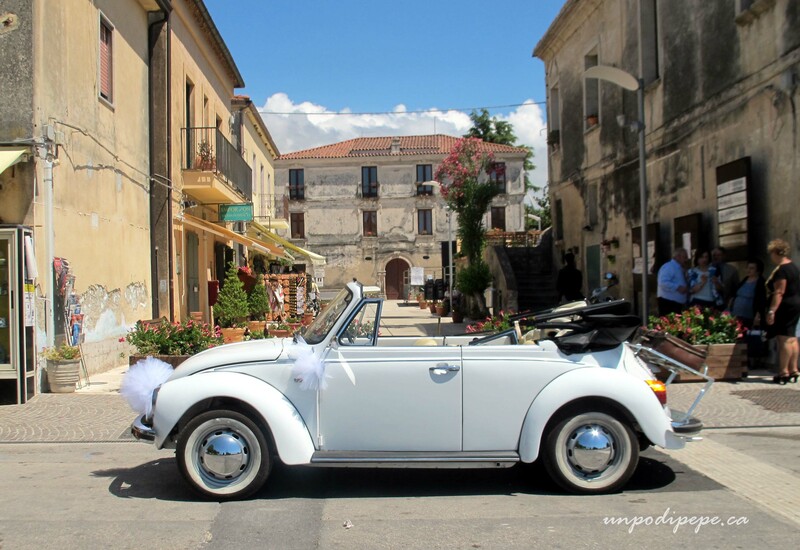 Paestum is in a quiet, idyllic setting in the countryside, surrounded by farmland. 3 well-preserved majestic Greek temples rise up out of the plain. 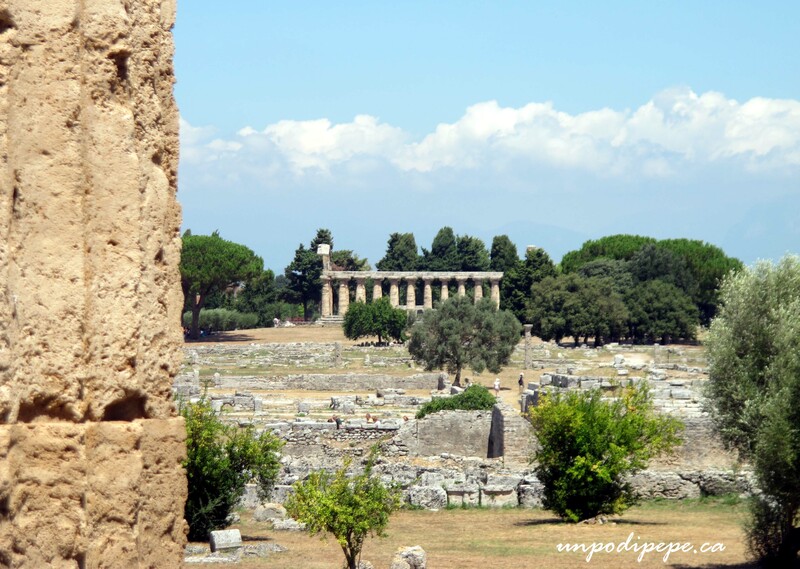 La Basilica is the oldest of the temples, built in 550 BC and is actually a temple to Hera. 18th century archeologists mistakenly identified it as a Roman building used as a meeting place. Right next to it, the Tempio di Nettuno (Neptune is the Roman equivalent of Poseidon) resembles the Parthenon. It was built in 460 BC and is the best preserved Doric temple outside of Greece. It is almost intact, with only the roof and a bit of the inside missing. You can actually walk inside both of these temples! A bit farther away from the other 2 temples is the Tempio di Cerere (Temple of Ceres/ Demeter) which was actually a temple to Athena. 18th Century archeologists must have been very confused. It was built in 500 BC and the architecture is part Doric, part Ionic. At some point, it was used as a church and has 3 medieval tombs in the floor. The inside of this temple is not accessible. The remains of the ancient city also include a Roman Forum, paved streets, the foundations of public buildings and many residential Roman houses, an amphitheater, and a swimming pool/gymnasium. Walking through the overgrown areas provides some of the best views and glimpses of some mosaic floors. The city walls, almost 5 km long, are mostly intact with 24 towers and 4 gates. Only 20% of the site has been excavated. 80% of Paestum is still buried under agricultural land, most of it privately owned. A road cuts the site in 2 and has a few restaurants, bars, souvenir shops, a small piazza, the Paleochristian church, an information center, and the museum. The amphitheater is only half exposed as the road was enlarged in the 1930’s and buried the east half of it! The Museo Nazionale contains all of the items found in tombs in and around Paestum and the Metopes from a temple 9 km away. There are also Giovanni Piranesi’s etchings of the site, printed in 1778. The most amazing thing in the museum was on loan and I did not get to see it! It is the 470 BC Tomba del Tuffatore, tomb of the diver, a fresco painted on the underside of a tomb which portrays a young man in mid-air diving off a cliff into water. It is thought to portray the harmonious passage from life to death. 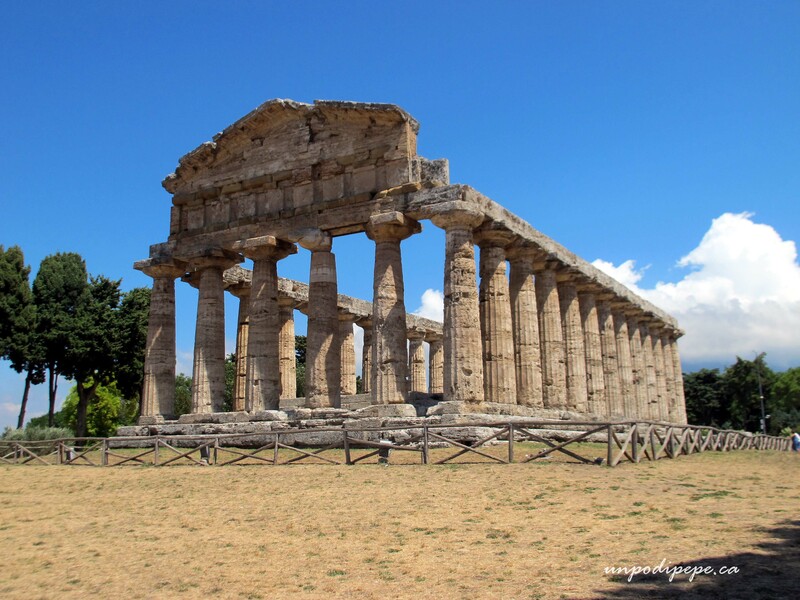 The Archeological site of Paestum is a UNESCO World Heritage Site, along with the Cilento coast, Vallo di Diano National Park, the archeological site of Velia and the Certosa di Padula. Today, Paestum is a Frazione or hamlet of Capaccio in the province of Salerno. It is accessible by bus or local train from Salerno (30 minutes), but the best way to get there is by car. The drive is spectacular and it is worth going out of the way for. Even on a ‘busy’ summer day, the site is not crowded. Staying the night is a great idea, as you can visit the ruins just before sunset. A combination ticket to the site and museum is €9. Spectacular site – love your photos! I happened to pass by Paestum in the train today and saw the big-block walls. They really knew how to build back in the day. 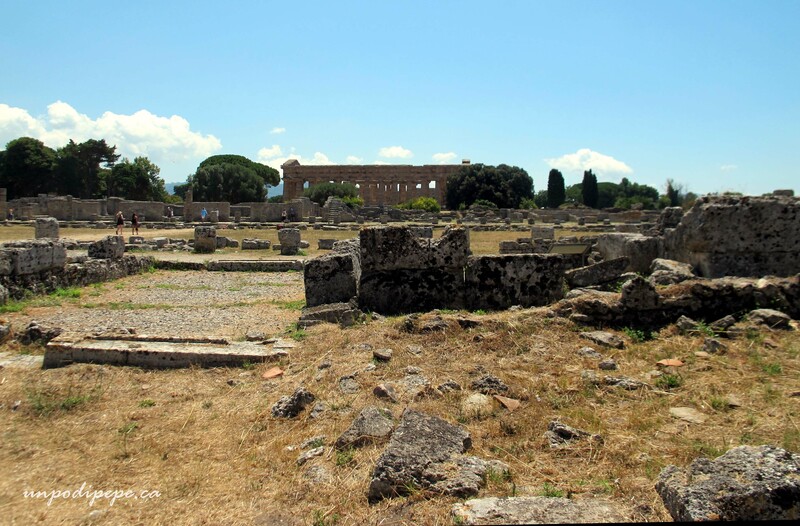 Yes, I visited Paestum and the museum a few years ago – couldn’t believe it! And I was lucky that the diver wasn’t on tour. I took a train from Battipaglia to Potenza – many tunnels, but also some dramatic mountains and lovely countryside. Alla prossima! 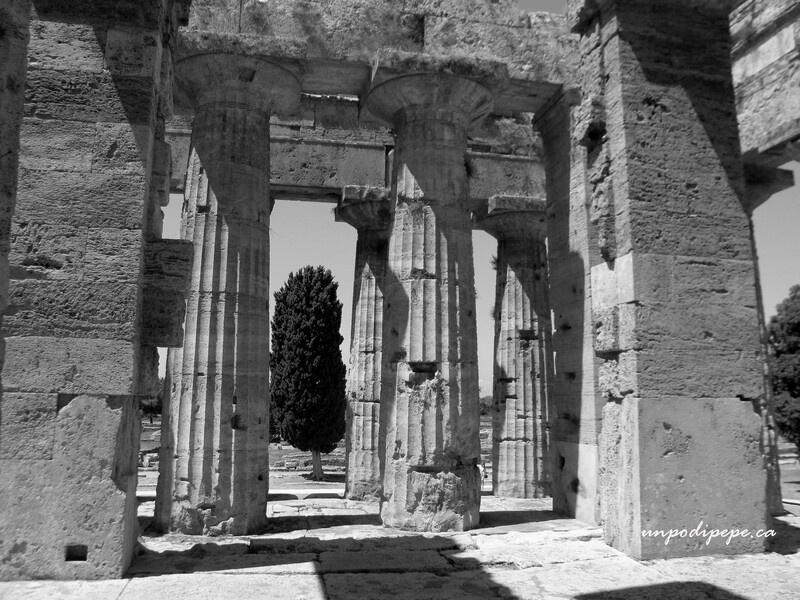 Great shots and very interesting history … Wonderful ..
Can you believe I lived all those years in Italy and never got to Paestum? Shame on me. Reblogged this on Journal Edge. Grazie Vikas. I’m glad you liked the post. My photos look so much better in your theme!